Family dinners are more than just a meal. It is about the only time that families have to share time through the week. Whether you sit down to the dinner table or enjoy a meal on tray tables and a movie in the family room, the important thing is that you are together. 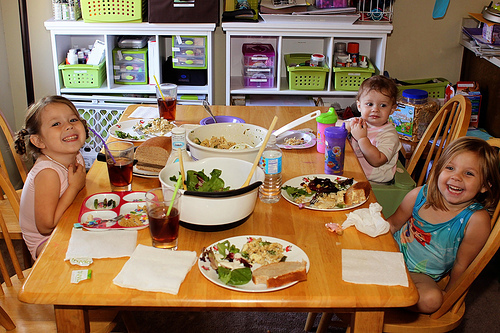 There are some interesting facts surrounding family dinner time. For instance, teens that spend dinner time eating with their family are less likely to get involved in drugs, alcohol or other illicit activity. This is a point many parents will find interesting. Out of all of the things you do to try to keep your kids away from bad influences, the one thing that is the greatest influence is still the event that we skip routinely. Why is dinner so important? For one thing, it is a time to share thoughts and feelings. All day, kids are influenced by teachers, friends and the outside world. At the dinner table, they get a chance to connect with their parents on tough issues like schoolwork, peer pressure, friendships and other things. They can each share and help one another with helpful suggestions. Parents can even talk about work or family finances over a meal. The main point is that conversation is taking place. The average parent talks to their child less than 40 minutes a week. It takes a second to say “Hi” when you come in at night, but that isn’t effective communication. When dinner is shared by the family, you spend at least 45 minutes to an hour talking about everything and anything that may be on your mind. Even if you are watching a television program, engaging questions can arise from topics addressed in the program. Young children learn how to communicate with their siblings and parents. They are the center of attention with questions about their day and it makes them feel happy. You know that kids always want to be in the limelight when they are a certain age and this helps them learn to share the spot with others. For teenage girls, body image is everything. Learning to prepare and eat healthy meals with their families is a sign that eating right will keep their bodies in shape and not avoiding food. Teen girls are less likely to become the victim of an eating disorder but develop a healthy view of food and their bodies when they eat dinner with their families. There are many benefits to eating dinner with the family. It is a time for meaningful communication that leads to stronger self-images that resist the urge of drugs, alcohol and other destructive behaviors in your kids and teens.